Homemade whole wheat bread is one of the best things you can have at breakfast. 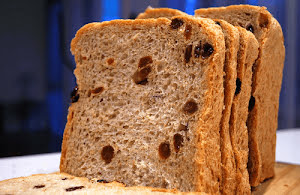 The following bread recipe is loaded with raisins and with a hint of cinnamon. It tastes heavenly with fresh fruit jam. To get the best texture and fluffiness, give dough ample time to rise before transferring to the oven. One can also go for a multi-grain variant instead of using whole wheat flour. This bread can last for up to a week in an airtight container. I always make 2 to 3 loaves of this bread because of the high demand, right within my home. Feel free to moderate the quantity of raisin as per your preferences. Let's quickly make this fluffy, nutritious, and fulfilling whole wheat raisin bread for our loved ones and friends. Do try this delicious and easy-to-make whole wheat raisin bread enhanced with cinnamon which gives it an irresistible flavor and a light and sweet aroma. Take a large bowl and add refined flour, refined sugar, salt, yeast, lukewarm milk, lukewarm refined vegetable oil, and cinnamon powder in it. Combine everything and beat for about 3 to 4 minutes. Slowly add both lukewarm water and whole wheat flour and continue beating till everything is combined well. Add raisins and fold in the mixture. Knead this dough base on a flat surface for about 6 minutes. Cover with a cloth and keep aside for about 40 minutes. Grease the loaf baking tin with a cooking spray or butter. Transfer the dough to the baking tin.